Got up. Sat in chair. At lunch. Sat in chair. Drank beer. Sat in chair. Ate Dinner. Drank Wine. Sat in Chair. Went to bed. As you can see, the day after our epic climb to watch La Vuelta was not exactly packed with activity. In fact, I did manage a short walk around the campsite to the top of the hill behind to see the view. The old legs were struggling though . 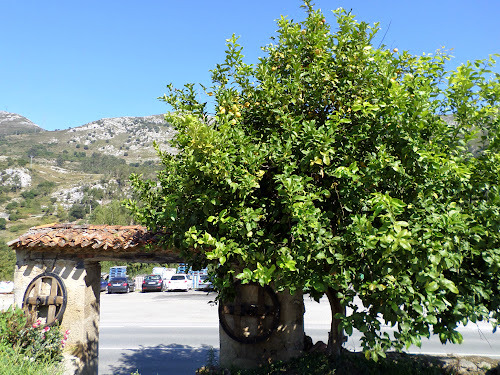 . .
One of the things about the Picos, and Asturias in general, is the quantity and value for money of the food. I have already mentioned some belly-busting meals of local Asturian fare, but this also extend to the very hedgerows. 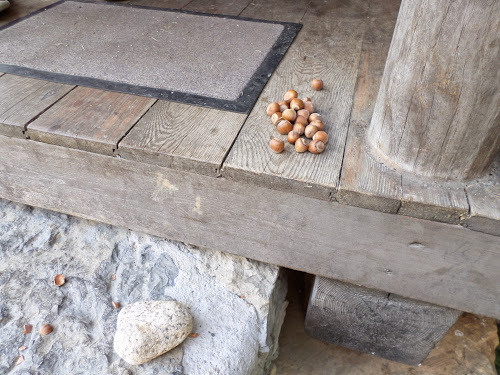 Overhanging our cabin is a hazelnut tree, and the fruit clearly ripens early here compared to Britain because the nuts have been falling on our heads as we sit. I decided to avail myself of nature’s bounty, and very nice they were too . . .
As another example, how about having this lemon tree outside your front door . . .
We are back at San Vicente on the return leg. 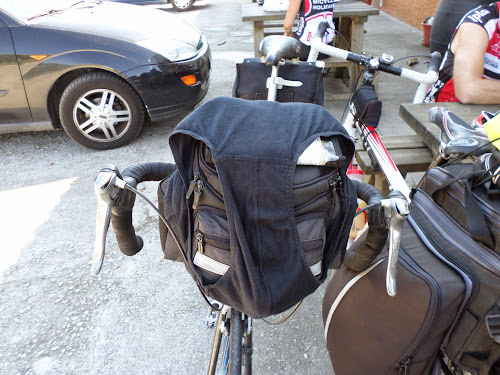 At the usual coffee stop in the transport café outside Panes I noticed that Colin had devised an ingenious method of keeping his bar-bag dry. Clearly a patent is in the offing, with the only disadvantages that I can see being the lack of complete coverage (though this could be easily remedied by using a more capacious pair of grundies) and the propensity for them to blow off into one’s face, thereby rendering the cyclist both blind and incapabale at the same time . . . While at the campsite we will once more eat in the restaurant, and this is my last chance to cajole Colin into an authentic attempt at pouring the sidra Asturian style, though we are now in Cantabria it must be said. Definitely think Colin should patent his covers! !